ISIS shot down an Iraqi military helicopter west of Baghdad on Wednesday, killing at least one person, officials said. The helicopter - the second lost by Iraq in two days - went down near Amriyat al-Fallujah, though officials differed on the exact location. An Iraqi army aviation captain said that the Bell helicopter was shot down with a Dushka heavy machine gun, killing one crew member and wounding a second, who was rescued by another helicopter. Lieutenant Colonel Arif al-Janabi, the police chief for Amriyat al-Fallujah, said that IS shot the helicopter down, putting the death toll at two. Shakir al-Essawi, the head of the area's local council, confirmed Janabi's account. ISIS issued an online statement claiming that it shot a helicopter down and damaged another in the Amriyat al-Fallujah area on Tuesday. 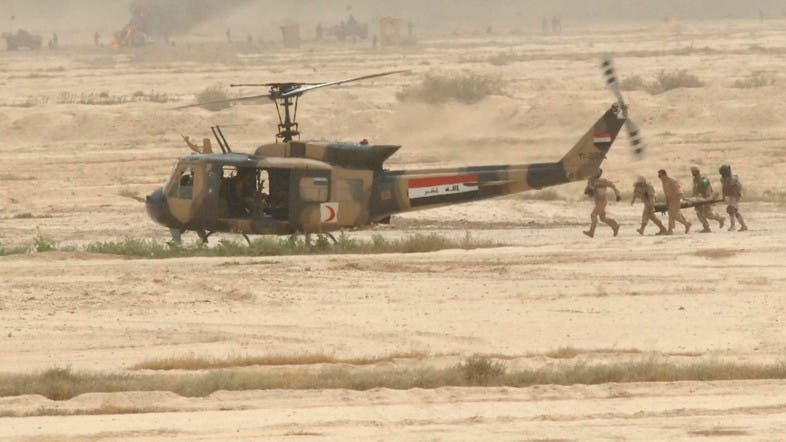 Iraq has lost multiple helicopters to accidents and ground fire in recent years, while others have been damaged. An Iraqi Mi-17 helicopter crashed south of Baghdad due to a “technical problem” on Tuesday, killing nine people. In October 2014, militants shot down a Bell 407 north of Baghdad, killing two crew, five days after an Mi-35 was shot down in the same area, while jihadists destroyed another helicopter on the ground earlier in the year. An overloaded helicopter crashed after delivering aid to people besieged by the Islamic State jihadist group on Mount Sinjar in August 2014, killing its pilot and injuring passengers, including a member of parliament. Lieutenant General Hassan Karim Khudayr was killed when a military helicopter crashed north of Baghdad before IS launched a sweeping offensive in June 2014. Iraq also lost an Mi-17 to a sandstorm in July 2010, a crash that killed five.